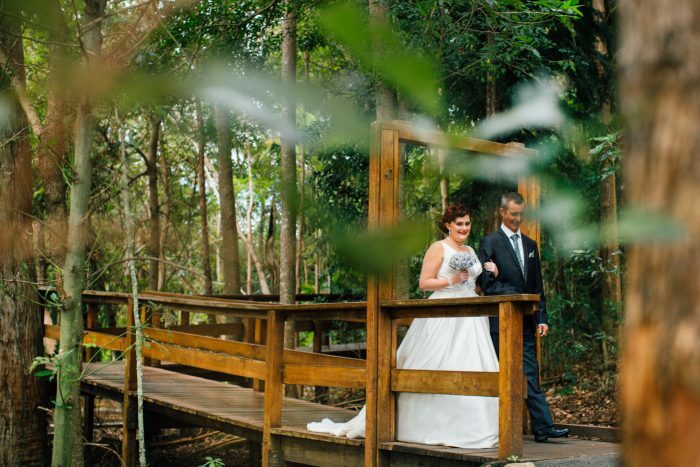 Megan and Adam’s rainforest wedding was held at the stunning Walkabout Creek wedding venue. 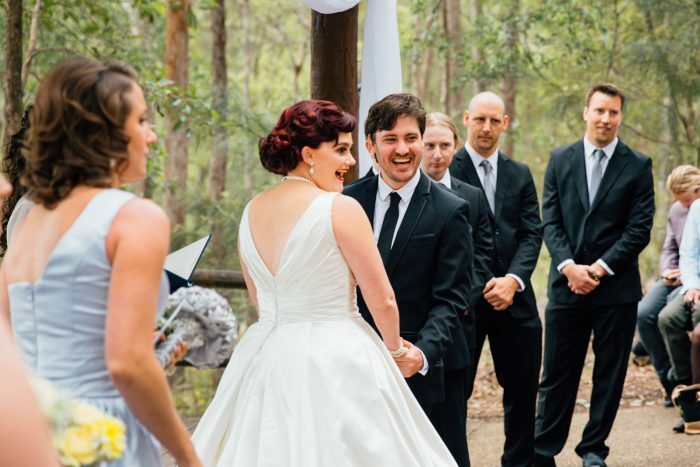 The couple tied the knot on the Lakeview Ceremony Stage before heading to the Banksia Room for the reception. Megan and Adam said their vows in a beautiful ceremony overlooking the lake. 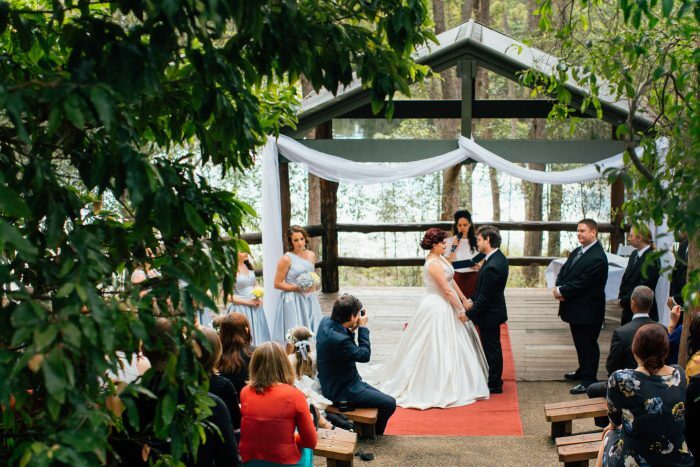 The Lakeview Ceremony Stage is nestled in the heart of the rainforest with wooden benches for guests to use. 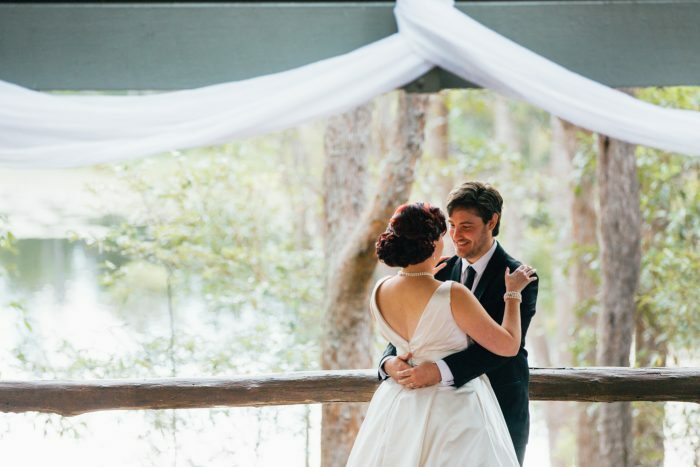 The couple stood under the forest hut with simple white drapery framing them with views of the lake in front. 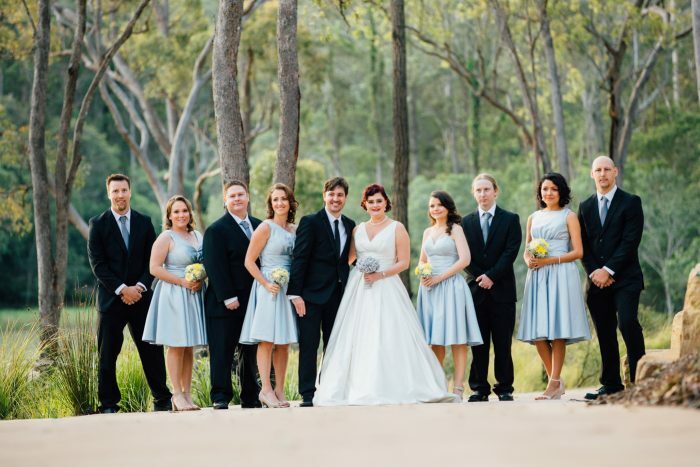 Following the ceremony, the bridal party took photos around the reserve whilst guests made their way to the Banksia Room for antipasto platters and a cash bar. The reception was held in the Banksia Room, a traditional room with panoramic views of the reservoir and a polished wooden dance floor. 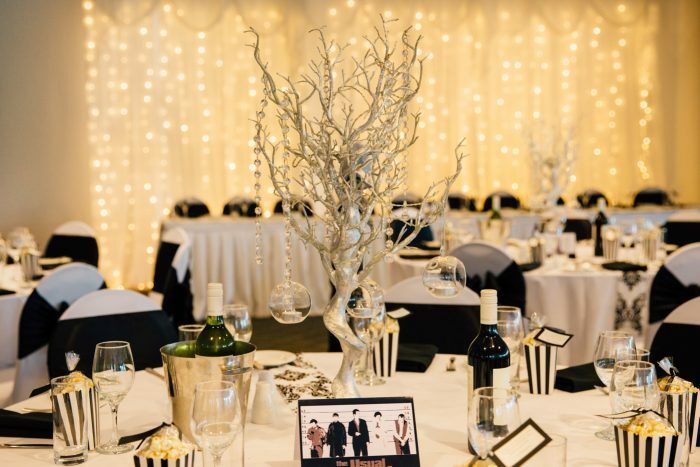 The reception was styled with black and white theming. White chair covers were used with a black satin bow on each seat. The centerpiece was a silver tree which hung tea light candles in glass votives. Behind the bridal table was a wall of fairy lights. The bridal table looked out over the reception space which was set up with round tables circling the dance floor. After the bridal party entered the room, a delicious hot buffet was served. Guests were treated to slow-cooked cottage pie, honey soy and sesame chicken with bok choi and mushroom and bacon carbonara bake. Accompanying these dishes were fried rice, seasoned roast vegetables, crispy caesar salad and greek salad. 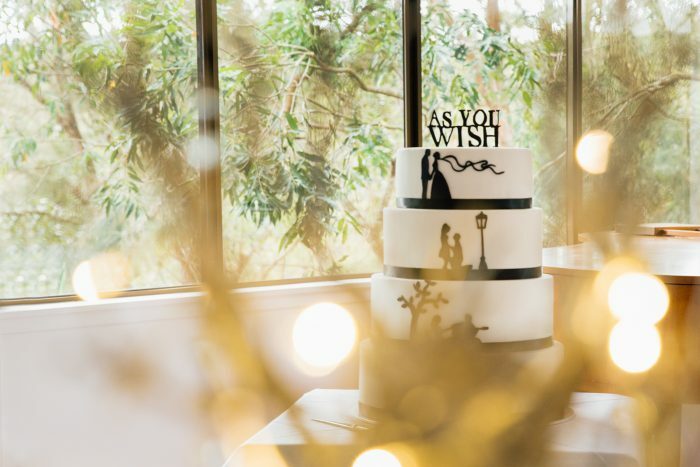 Once the couple had finished their first dance, the wedding cake was served on platters alongside tea and coffee. The night ended with a last dance and farewell circle before a limousine whisked the couple away to their accommodation. 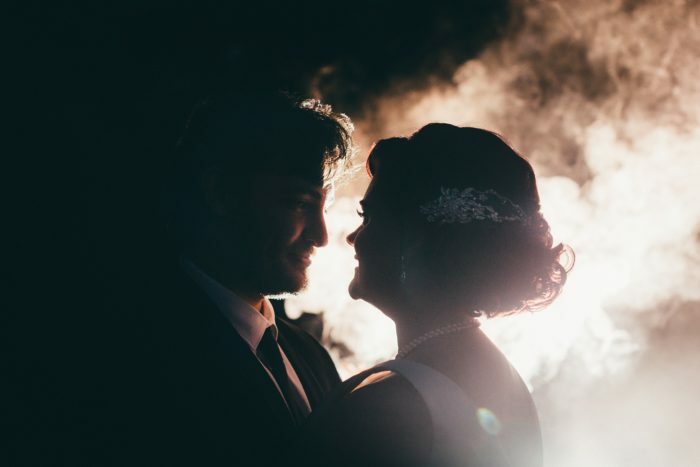 We understand that your special day requires personalised attention on every front, so we are dedicated to going above and beyond on your wedding day. 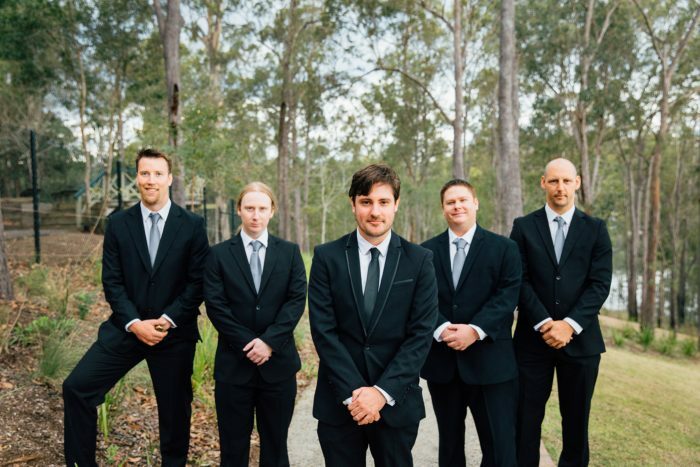 If you would like to host your own wedding at our rainforest venue, please contact our specialised team today.